Diamond wedding rings are as traditional as you can get. Very few marriages take place without the exchange of diamond wedding rings. While people do sometimes shake things up with different types or styles of rings, a diamond is usually in there somewhere. But with so many gemstones available, why does the diamond get all the attention? Why is the diamond more prized than say a ruby or garnet? Read on to find out. Couples were getting married long before diamond wedding rings existed. It was totally acceptable to use gemstones such as rubies, emeralds, or sapphires in a wedding ring. However, all of this was before diamonds were widely available. After diamonds were discovered in abundance in Africa, more people started using them for rings. The demand for diamond wedding rings was high, and so was the price. Usually only the very rich could afford diamonds. Diamonds soon became a status symbol. Since only the rich could afford diamond wedding rings, having one on your finger said a lot about your place in life. But soon, the supply of diamonds outweighed the demand. As with anything that becomes very popular, the market soon became overrun with merchandise. When the prices for diamonds began to fall, more people were able to afford them. Diamond wedding rings lost some of their status, and people once again returned to using alternative gemstones. By the mid 20th century, diamond wedding rings became popular again. And they are still the wedding ring gemstone of choice. It’s highly unlikely that diamond wedding rings will fall out of favor again. However, what is changing now is how diamond wedding rings are bought. Online wedding ring sales at sites like Novori.com are growing every year. 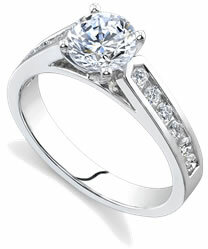 People are finding that the place to find the best quality diamonds and rings at the best prices are online. At Novori Jewelry, we are an online jeweler and we pass the savings of low overhead on diamonds and rings directly to you. We even offer a lowest price guarantee for Novori. Now more than ever couples can afford a real natural diamond and go with traditional diamond wedding rings. If you’re interested in diamond wedding rings, you certainly will have a large selection. Since most people prefer diamonds, online retailer is the way to go. It may even be easier to shop online because the selection will be much larger and more diverse and the prices will certainly be much, much lower than at a local store. The first thing you should do is set a budget. This isn’t so important if you’re filthy rich, but if you’re not, you will need a budget. There are plenty of inexpensive wedding rings that are just as beautiful as extremely expensive ones. Setting a budget, and sticking to it, can save you disappointment later one. At Novori we like to work within your budget to find the diamond of your dreams. What size of diamond you prefer. If the band will be gold, silver, or platinum. If other gemstones besides a diamond will also adorn the ring. Most diamond wedding rings can be used with any type of setting. As long as your band can accommodate the setting you want, then it shouldn’t be a problem. For an idea of which settings work best with which bands, spend time looking at pictures of diamond wedding rings. You can also speak with a Novori sales representative for suggestions on how to achieve the look you want. To make things a bit easier, this section of the article will cover some common settings for diamond wedding rings. The choices are numerous, and can be a bit overwhelming. But don’t get stressed out. Shopping for diamond engagement rings should be fun, not a chore. The Channel setting is also a popular choice. This setting requires the use of numerous diamonds. This choice sets diamonds into a metal channel so they appear to be rapped around the band. Or maybe a better description would be that the diamonds appear to be submerged into the band. The diamonds lay flat, so the exterior surface is smooth to the touch. This is a great setting for an active person. The diamonds are less likely to suffer damage or fall out of the setting due to rough activity. This setting also serves as a great compliment to a solitaire diamond. The Prong setting is very popular and the most common way to secure a diamond to a setting. Many couples chose it because it’s simple, but beautiful as well. The prong setting uses four hooks, sometimes six, that hold the diamond in place slightly above the band. The hooks are slender, so they’re not unsightly or threatening. Since the diamond ring is suspended above the band, it receives an equal amount of light from all directions. This actually creates an optical illusion. Many people say the prong settings cause diamonds to look larger and more stunning. You can also choose a larger sized diamond if you’re going with a prong setting. It’s better suited for holding larger diamonds than some of the other settings. The prongs can be adjusted to fit the shape and size of the diamond. This setting uses a metal rim to secure the center stone. The rim extends slightly above the gemstone, so it appears to be encased. Diamond wedding rings that use this setting are very noticeable. The Bezel setting is very reliable and secure. The edges of the gemstone are protected by the rim, so it’s almost impossible to remove a diamond from a Bezel setting without professional tools. Some of the designer engagement rings at www.novori.com use Bezel setting because of their beauty and security. These are only a few settings available for diamond wedding rings. Once you began your search for the perfect ring, you’ll discover many more options. If you need assistance with your search for a diamond wedding ring or to find a certified diamond within your price range, please contact us toll free at 1-877-877-4141. We are here to help.